The director of public prosecutions, Keir Starmer QC, today rejected calls to create a regime in which assisted suicide is permitted in England and Wales, saying it is an issue for parliament. Publishing guidelines to clarify when an individual might not face prosecution under the 1961 Suicide Act for helping a friend or loved one die, Starmer said he was not decriminalising the offence of encouraging or assisting suicide, which carries a maximum prison sentence of 14 years. "Nothing in this policy could be taken to amount to an assurance that a person will not be prosecuted if he assists the suicide or attempted suicide of another person," the DPP said. The guidelines place closer scrutiny on the motives of the suspect rather than the condition of the victim, such as whether they are terminally ill. They also make clear that to be related to a victim will not be considered a mitigating factor, given that some relatives might be manipulative. Starmer said so-called mercy killings, such as the case of Kay Gilderdale, recently acquitted by a jury of her daughter's attempted murder, were not covered by the guidelines. "The policy does not open the door for euthanasia or so-called mercy killings," he said. "The act of suicide requires the victim to take his or her own life. Euthanasia or mercy killing are where the suspect takes the life of another and they may well be liable to a charge of murder or manslaughter. That distinction is an important one which we all need to understand." • The victim reached a clear, voluntary decision to commit suicide. • The suspect was wholly motivated by compassion. • The suspect reported the suicide to the police and fully assisted inquiries. In all there are 16 factors which will be seen to favour a prosecution, including if the victim is under 18, the suspect stood to gain or was paid. Starmer said the guidelines had been drawn up after the "most extensive snapshot of public opinion" since the drawing up of the 1961 Act. Some 4,800 individuals responded in a six-month consultation exercise. Crucially, the issue of whether a victim had a terminal illness, incurable physical disability or severe degenerative physical condition, will no longer mitigate against prosecution. Starmer said respondents had suggested the inclusion of these factors gave the impression that vulnerable people were less protected by the law. The guidelines now concentrate not on the health of the victim, but on the motivations of the suspect – for example, clear evidence of compassion will mitigate against prosecution. Starmer made clear he was not changing the law, passing the responsibility for any statutory change to parliament. On whether a living will mitigated against prosecution, Starmer said it was not his job to set out a context in which assisted suicide was accepted and legal in society. "Only parliament can set out what processes or procedures might be appropriate in the context of encouraging or assisting suicide that may lead to an automatic decision not to prosecute," he said. "Any requirement for their to be a Living Will or for a doctor to confirm that the victim was terminally ill, another suggestion, is clearly within the scope of processes and procedures that... create a regime for encouraging or assisting suicide. "Only parliament can determine the legality of such a regime, not the DPP ... and we have rejected any factor against prosecution that could be said to be a stepping stone towards the creation of such a regime," he said. 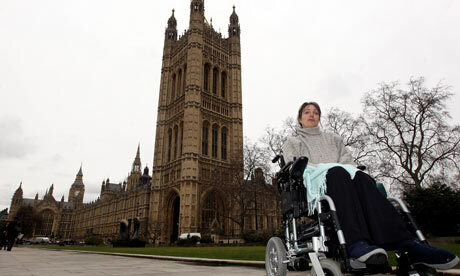 Starmer had been required to publish the guidelines after the House of Lords judgment in the case of Debbie Purdy, who has multiple sclerosis, who wanted clarification of whether her husband would be prosecuted if he accompanied her to the Swiss clinic Dignitas, which helps the terminally ill to die. Purdy said today she was delighted with the published guidelines. "Because I will know the likely consequences of any decisions I choose to make about my death I won't have to make those decisions early," she said. She still wanted the law to change. "I will continue to campaign for assisted dying to be legal in the UK," she said. Other campaigners said it was time for the government to fulfil its responsibility and address the need to create a compassionate regime around end of life issues. Jayne Spink, the director of policy and research at the MS Society, said: "There is still a long way to go before the palliative and end of life care offered to people with MS is the best it can be. The DPP guidance does not detract from the unfulfilled duty of care from the government." Richard Hawkes, the chief executive of Scope, however, feared the guidelines could frighten disabled people. "We are very concerned about the potential impact of the DPP's new guidelines on assisted suicide," he said. "We know that many disabled people are genuinely frightened about any changes which risk weakening the protection offered by existing law and which could effectively create legislation by the back door."